Personality: When somebody talks about Laura, usually they say that she is an extremely driven individual. They say that she never quits, and that she pursues her goal to the end, no matter the cost. On the outside, she is a happy-go-lucky teenager bordering on hyperactivity. She buzzes around, as cheerful and excitable as anyone possibly could be. She loves to help people, and also has a tendency to be a bit of a show-off at times. This is not cockiness or arrogance, however, just Laura attempting to prove to others and to herself that she is a capable individual. In the core, however, lies something darker. Laura has experienced loss and heartbreak, and it is these feelings that burn deep inside her, pushing her to always improve, to always do better. Whilst outside combat, Laura is affable and cheery. When battle is joined however, the fire inside erupts. She becomes extremely single-minded and determined, to the point of fanaticism. To her, the safety of her remaining friends and loved ones is the absolute objective. Even if that safety comes at the price of her own. In her spare time, Laura loves to fiddle around with gadgets and machinery. To this end, she tracked down the enigmatic Gaige Ashe and studied under her tutelage. During this time she developed an affinity for hi-tech weapons, and she prizes her Crescent Rose sniper-scythe like a sister. It was also during this time that she witnessed first-hand the terror that is Gaige’s Railgun, something she has been mortally terrified of ever since. Working with tech for such a long time also resulted in Laura being slightly deficient in regards to human interactions. While she enjoys trying to help other people, she does tend to misjudge their feelings, and tends to not know when she annoys them. As stated above, Laura generally gets on with just about anybody. 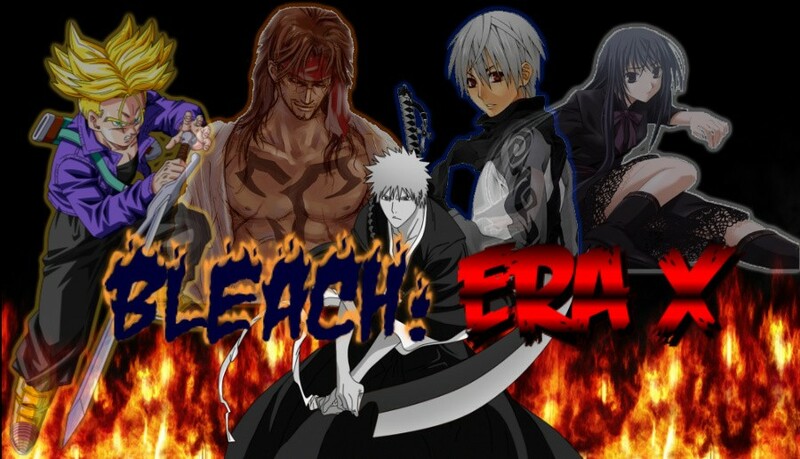 The exception being of course those who seek to harm others, such as Hollow, Sinners and Arrancar. There are two beings however who do not fit into this assessment. She gets on extremely well with the Arrancar Liv Firestorm. Liv helped her out of a particularly bad situation once and she has been like a big sister to Laura ever since. The other is Kain Lasdren, whom she hates with every fibre of her being. And probably always will. Physical Traits: Laura appears as a young, pale-skinned girl with grey eyes. Her face has the appearance of a cutesy, happy girl. Her hair is mostly black but is also lightly red-streaked, a tribute to her love and a reminder of her cause. She is rather short and slim, but her appearance has no bearing on her actual combat ability. Clothing: Laura appears as a young girl dressed in a red cloak, black blouse, and a skirt with red trimmings. Her entire apparel is made up of various shades of red and black, with black on the main suit and red on the cloak and hood. The pins holding the cloak to the shirt are cross shaped. Laura’s fighting style is very much like the girl herself, brave but reckless. She utilizes her weapon’s unique design to maximize her already formidable speed. 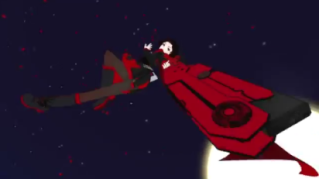 The recoil of the Gun component is used to launch her at staggering speeds across the battlefield, and also to increase the velocity of her swings with the Scythe component. Laura’s ability use policy is also suitably reckless. She will use use her abilities as they occur to her. The only exception is her final ability, which she will only use as an absolute last resort, and even then will try to look for any other options first. Speed: Laura’s main strength. She is extremely quick to begin with, but due to her small stature, her already high agility is further increased by utilizing her weapon's recoil. Very few times does an opponent come close to striking her. Intelligence: Laura has spent a long time studying under the tutelage of Gaige Ashe. As such, she has developed an uncanny resourcefulness in most situations, especially where electronics and machinery are involved. It is not quite on par with Gaige, but it is still formidable and has gotten her out of some very sticky situations.. Weapon Skill: Laura is highly adept at using her scythe, Crescent Rose. She is skilled in both Scythe and Gun components, slicing away at multiple opponents with blurring speed and accurately firing upon close- and long-range targets. Strength: Laura’s small stature means she lacks the physical strength that other fighters have. She relies on evasion to avoid harm. Durability: As stated above, Laura relies on evasion to avoid attacks. She cannot take very much damage before she is knocked out. Reiatsu Control: Laura’s control over her reiatsu is sloppy at best. As such she cannot suppress it and has trouble using it for things other than her powers. Appearance: Crescent Rose appears to be a highly advanced technological piece of equipment, being able to freely transform from its compacted self, to its gun mode, to a full scythe quickly. As its name implies, its color is rose-red with black trims and the blade is crescent in shape. Powers: Crescent Rose is a High Caliber Sniper-Scythe (HCSS), a hybrid between a scythe and a rifle and, according to Gaige, one of the most badass weapon types designed. It has very high recoil, which Laura uses to great effect in her mobility; firing shots to propel her high in the air or quickly at her enemies. 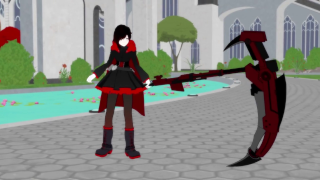 In order to use Crescent Rose to its fullest potential in melee combat, Laura can fire a shot immediately before a swing, using the recoil to accelerate the scythe, increasing the power of her attacks. Crescent Rose can fold up tightly for easy transportation and for convenience, stored underneath Laura's cloak, at her waist. Although Crescent Rose can fold into the form of a gun, which bears a small resemblance to a shotgun, it does not have to be in that form to fire. 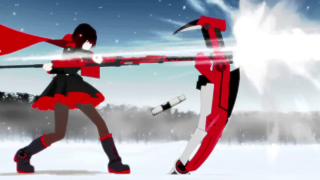 It is a bolt-action weapon, as Laura can also embed the scythe's blade into the ground to prevent the recoil caused by firing from sending her flying. Regular: Crescent rose takes a .50 caliber, reiatsu-infused round round(i.e. able to harm spiritual beings). Because of the size of the bullet, damage output is closer to 2 bala in damage. 10 rounds per clip. 5 clips per thread. Armor-Piercing: These rounds are designed to punch through strong armor and hierro, making it easier to deliver damage, and are also reiatsu-infused. But they do slightly less damage, at 1 and a half bala. 10 per clip, 3 clips per thread. Effect: Laura has the ability to “flash-step” a short distance. This involves Laura willing herself to another position within 30ft at extreme speed. The position has to be reachable normally (i.e. not through solid objects) and she can be hit if the opponent is possessed of ridiculous speed. She cannot change direction during this movement (i.e. she must move in a straight line), however she can change the direction she is facing. When this ability is used, Laura steps away to be replaced by a small clump of rose petals, which flutter away wistfully. Effect: Laura throws a punch from afar and the result is a giant fist made of rose petals emerges from the ground in front of her and strikes at her foe. The fist is roughly 10ft in diameter and has all of the force and mass of solid stone. It travels at the speed of a regular punch and hits with the force of a mass of rock of its size. Because it is made up of thousands of rose petals, any attempt to cut through it will not affect its speed or trajectory, as the blows travel straight through it, creating a temporary partition in the petals that is closed instantly. She can throw this punch at a target up to 50ft away. Once the punch hits, or misses, the petals disperse harmlessly. This, and the subsequent powers in this tree, count petal(earth/plant?) manipulation. 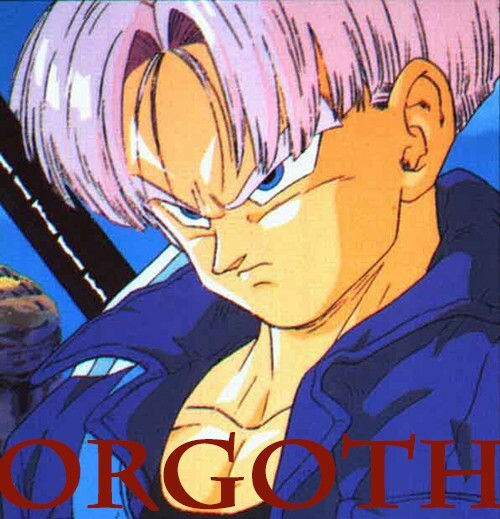 Effect: Laura can sheath her body in a rock-hard shell that is as hard as average hierro. The armor appears as a covering of giant rose petals, only incredibly hard. The armor does not weigh her down, but it only protects against physical attacks, energy attacks still hit her directly. This armor lasts for 3 posts, and has a 2 post cooldown. Effect: This ability is a variant of the “Piercing Rose Thorn”. This attack starts off the same way, with Laura forming a rose petal javelin in front of her. This projectile is not armored however, so it can be cut easier. As soon as it impacts with anything, either from somebody attacking it or it hitting its target, it will explode outwards in a similar fashion to a shrapnel grenade, sending thousands of razor-sharp petals through the air. Anyone caught in the blast will take 2 cero worth of damage, but will only penetrate weak hierro. The blast has a 10ft radius. 3 post cooldown. Description: Laura retains the following abilities from her Primary Stage: Afterimage, Blur, Petal Dance. Description: This ability upgrades “Petal Punch”. Laura no longer has to physically throw a punch, as the fists are no controlled purely by thought. The fist is roughly 10ft in diameter and has all of the force and mass of solid stone. It travels at the speed of a regular punch and hits with the force of a mass of rock of its size. Because it is made up of thousands of rose petals, any attempt to cut through it will not affect its speed or trajectory, as the blows travel straight through it, creating a temporary partition in the petals that is closed instantly. She can punch at a target up to 100ft away and can have a max of two fists active at a time. Once the punches hit, or miss, the petals disperse harmlessly. Description: This is an upgrade of her “Armor of the Blooming Rose” Primary Stage power. Laura sheaths her body in an even harder shell that is as hard as strong hierro. The armor appears as a covering of giant rose petals, only incredibly hard. The armor does not weigh her down, but it only protects against physical attacks, energy attacks still hit her directly. This armor lasts for 3 posts, and has a 2 post cooldown. Description: This is an improved version of her “Deflector Shield” Primary Stage power. By spinning Crescent Rose in front of her and channeling Reiatsu into it, Laura can create a circular barrier in front of her, the diameter of which is roughly the length of the weapon. This ability is characterised by rose petals emanating from the weapon as it spins. The field blocks and dissipates any attack up to a Gran Rey cero in strength without any negative effects. The field also blocks attacks higher than Gran Rey cero and up to Cero Oscuras power, but instead of dissipating the attack, it simply impacts on the shield with full force. The force knocks her back a considerable amount. This could potentially send her careening into things and damaging her. 3 post cooldown. Description: This ability is an upgrade of the “Explosive Rose Thorn”. This attack starts off the same way, with Laura forming a rose petal javelin in front of her. This projectile is not armored however, so it can be cut easier. As soon as it impacts with anything, either from somebody attacking it or it hitting its target, it will explode outwards in a similar fashion to a shrapnel grenade, sending thousands of razor-sharp petals through the air. Anyone caught in the blast will take 2 cero worth of damage, but will only penetrate average hierro. The blast has a 20ft radius. 3 post cooldown. Description: Laura uses her Rose Magazine. Due to the powerful nature of this ammunition and the difficulty of making it, Laura only carries 1 per thread. Laura loads the magazine into Crescent Rose and fires into the sky. A vast cloud of rose petals fills the sky, covering an area 100ft in diameter and 100ft above the point of firing. Utilizing her reiatsu, Laura then pulls the petals down, showering the area. Each petal that hits something deals a bala of damage, and they fall at that speed. The petals continue down until they hit the ground, embedding themselves underneath the top layer of terrain. The petals are extremely hard to destroy, the equivalent of zanpakuto steel, and they remain dormant in the ground until “Red Like Roses, Part 2” is initiated. Description: This ability upgrades “Petal Pugilist”. Laura does not have to physically throw a punch, as the fists are now controlled purely by thought. The fist is roughly 5ft in diameter and has all of the force and mass of solid stone. It travels at the speed of a regular punch and hits with the force of a mass of rock of its size. Because it is made up of thousands of rose petals, any attempt to cut through it will not affect its speed or trajectory, as the blows travel straight through it, creating a temporary partition in the petals that is closed instantly. She can punch at a target up to 100ft away and can have a max of four fists active at a time. Once the punches hit, or miss, the petals disperse harmlessly. Description: This is an upgrade of her “Armor of the Rose Knight” Final Stage power. Laura sheaths her body in an even harder shell that is as hard as strong hierro. The armor appears as a covering of giant rose petals, only incredibly hard. The armor does not weigh her down, but it only protects against physical attacks, energy attacks still hit her directly. This armor is active constantly while Laura is in Hyper Mode. Description: This is an improved version of her “Beta Deflector Shield” Final Stage power. By spinning Crescent Rose in front of her and channeling Reiatsu into it, Laura can create a circular barrier in front of her, the diameter of which is roughly the length of the weapon. This ability is characterised by rose petals emanating from the weapon as it spins. The field blocks and dissipates any attack up to a Cero Oscuras cero in strength without any negative effects. The field also blocks attacks higher than Cero Oscuras power, but instead of dissipating the attack, it simply impacts on the shield with full force. The force knocks her back a considerable amount and she takes half of the attacks full damage. This could potentially send her careening into things and damaging her. 4 post cooldown. Description: This ability is only usable if “Red Like Roses, Part 1” has been executed in this thread. Laura loads her “Red Magazine” into Crescent Rose. Due to the same limitations as the “Rose Magazine”, she only carries 1 per thread. After loading the magazine, Laura infuses it with all of her remaining reiatsu, meaning that she is out of the fight once this ability is used. Laura fires at a target, either an opponent or any kind of solid surface. The shot travels at the same speed as regular bullets (a bala). Once the shot hits it’s target (or whatever surface it collides with), the projectile sticks into the target, not causing any damage, but it reduces the target's speed by 20%. The target can attempt to pull out the projectile, but it embeds quite deep in the surface and is barbed. It is also charged with all of Laura's spiritual energy. The dangers of handling such an object, as well as trying to pull such an object out of, say, your chest, are obvious. This is not all, however. Once a target has been stuck, all of the intact rose petals that were created by “Red Like Roses, Part 1” hurtle towards the stuck target, attracted to the reiatsu signature of the “Red” round. They travel at the speed of a cero, and they can be deflected by any barrier or shield that can block a cero, and anything that can break a very strong hierro will destroy a petal. However if deflected they will keep trying to home in on their target, leading them to travel around said barriers. They continue to pursue the tagged target for 3 posts. Once at least one petal reaches the target and touches it, the barb disintegrates and the energy transfers to the petal, which begins to glow brightly. All of the other petals disintegrate. The petal falls to the floor and there is a split-second delay before it violently explodes. The explosion has a blast radius of 300ft, and anything caught in it suffers damage equal to 2 Cero Oscuras. Laura’s life started off simple. Daughter of George Fisher, a renowned Australian T.V. chef, and Rose Fisher, a primary school teacher. They lived in Brisbane, Australia and were very happy. She had a full and healthy upbringing. Eventually, George retired from the T.V. scene and they decided to move somewhere new, where they would be safe and peaceful. The new home was in a town called Village. It was here that a young Laura would have her first experience with spiritual beings. During the family’s first year in Village, a large congregation of hollow randomly attacked the town. Nobody saw it coming. Neither did they see their salvation. A grizzled man wearing a black haori appeared in the center of the town. He seemed to be quite a powerful individual, as he hollow seemed to be afraid of him. He was accompanied by a young man, only slightly older than Laura, who had flaming red hair and speed unlike any human she had ever seen. The two individuals then set forth and slayed every hollow he could find, with those he couldn’t fleeing through some kind of portals. 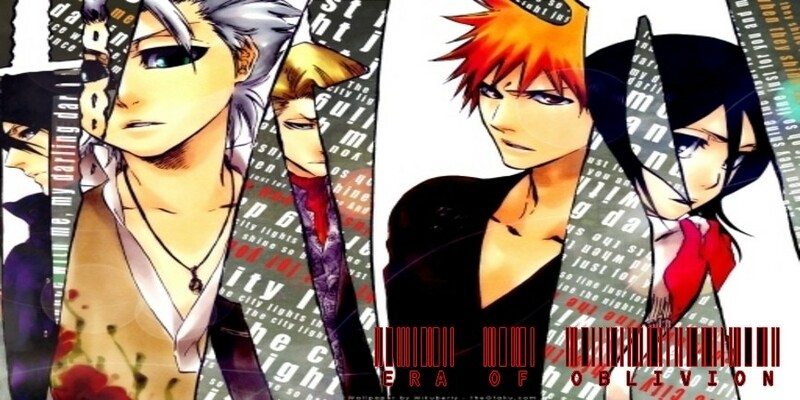 The introduced himself as a Shinigami, a spirit reaper, and stated that he was the protector of Village against what he called, “spiritual interference”. The young man was called Tadatomo Fukushima and was the Shinigami’s human protegé. As fate would have it, this would not be the last time Laura and Tadatomo would cross paths. When Laura was 15, she acquired a job in a local gym. In her spare time, she had developed a love of gadgets and gizmos. She would take home any little device she came across and practice taking them apart and putting them back together until she fully understood everything about them. Little did she know that she would be relying on this skill further on down the road. Working in the gym, she noticed she had acquired a bit of a fanbase among the teenage boys in the area. Not entirely surprising, as her then blond hair, silver eyes and Australian accent made her seem quite attractive. However, there was only one guy she could think about. Ever since that encounter with the Shinigami, Laura had been enthralled by the flame-haired youth that had accompanied him. She had continued to hear tales of him protecting Village from any who intended harm, and helping people all over town. She had also heard that he was notoriously shy, and had trouble just being around the female population of Village. Laura found this confusing, yet endearing, that a handsome and kind individual could still be so embarrassed around people. So naturally, she was stunned when Tadatomo started coming to the gym where she worked. She worked hard to try and curb her naturally excitable self when he was there, to try and make him feel less uncomfortable. As it was though, he rarely showed up when she was on, preferring instead to arrive later, when there were less people around. Whenever Laura did see Tadatomo though, she tried her heart out to try and get him to notice her. To try and find any sign that he might feel about her the same as she felt about him short of asking him out directly. She would regret not being direct soon, as the dark side of fate would rear its ugly head. One late afternoon, Laura was working late to cover a colleague who had taken ill. She was doodling and generally being bored when Tadatomo walked in. Their greetings to each other were predictably awkward, but for the first time, Laura caught a glimpse of something in his eyes and expression that gave her hope. But then, a mercenary known as Kain Lasdren entered the building, demanding info about Tadatomo. In her love-blindness, she had tried to stall him but he had sensed her feelings for him and took her captive. Kain raced to a clearing just outside of town, awaiting Tadatomo. The fight that ensued was brutal. Tadatomo was severely outmatched, and took a large amount of punishment. After the final explosion, in which Tadatomo had injured himself in destroying a Kain clon, Laura ran to him, but Kain kicked her aside. He grabbed Tadatomo and left. Laura was spent as Kain’s ice sprite carried her and deposited her in front of her now destroyed gym. Filling up first with regret, then with a steely resolve to get back what she’d lost, she headed home. She left a note for her parents and packed up some things in a rucksack. Her new journey had begun. Laura arrived at the home of the Shinigami. He already knew what had happened and was filled with sorrow. Vowing to not let something like this happen again, the Shinigami offered to train Laura in combat. Under his tutelage, she reached levels of power that she had never conceived. 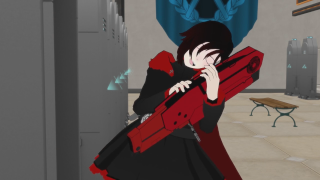 Because her techniques were a manifestation of her soul, all of her abilities utilised red rose petals. Due to her new increased power, her hair transformed from blonde to her current color of black, with red highlights. During this period she visited her parents from time to time, ignoring their pleas to come home. Her parents would then be killed in a hollow attack some months later. In a rage, she charged at every enemy she could find, attacking recklessly. Her inexperience almost cost her her own life, were it not for the intervention by a flame-haired girl with golden gauntlets. The girl fought off the remaining hollow and, together with the Shinigami, sealed the portal that they came from. The girl introduced herself as Liv Firestorm, “an arrancar, but don’t worry! I’m a good arrancar!”. Laura was grief-stricken by the death of her parents, she almost succumbed to her grief. But the care of Liv, who treated Laura like her own little sister, convinced her to continue to her goal. Laura turned 18, and she and the Shinigami both decided that she had learned all she could from him. She visited the grave of her parents one last time, red hood standing out against the pristine clearing.. Along with Liv, she came to the conclusion in order to reach her full potential, she needed to return to her roots and add some technology to her arsenal. To that end, Laura and Liv embarked on a journey to find the greatest of engineers, whose technological expertise was unmatched across the world. Their journey took them to Gaige Ashe. Laura learned much under the study of Gaige, crafting her faithful Crescent Rose here. She balanced her study of technology with her continued combat training with Liv. During this time, due to the influences of both Liv and Gaige, she had developed a giggly, hyperactive personality. She did not forget her grief and loss, but simply used them as fuel instead of letting it use her. Laura came to love her new friends. She did acquire a debilitating fear of Gaige’s railgun however, after a mishap that caused the destruction of a mountain. After seeing this display of power, Laura decided she did not want to see such a weapon again. Thinking about it still gives her chills. Not forgetting she still had a task to do, upon reaching the age of 19 she reflected on the new friends she had made and the fact that, reminded Liv, she was not alone in her quest. Smiling to herself, she began her search. and takes me to the place you rest. Burdened by her royal test. Size of the fists in petal knockout is a bit to big at 10 foot could you bring it down to 5 foot? You do have 4 in this mode. Unless the bullets explode, I don't see a need for a power level on them. They do penetration like damage, like a sword being stabbed into you. I don't mind that the armor peircing not going in as far if they do their job, though. I am assuming the speed of the bullets are bala, however. On blur...I don't understand why it gives a 50% defence boost and why it has a lasting power / cooldown. I don't even get the 50% defence boost. Standard Blur deals with speed and is the shunpo/sonido equivalent. So unless there's something else there that I'm not getting that's utilizing the "light" part (which it doesn't from what I can tell), both this and the afterimage are kinda lumped into the speed part. Actually, your afterimage seems more like a combination shinigami's cicada speed move and an afterimage. Not that I have a problem with it, just saying is all. Deflector Shield: Needs a cooldown since it blocks up to Gran Rey. It's usually 3, but I'm willing to lower it to 2 considering you're still knocked back. Red Like Roses, Part 1: Only thing I want to make sure of, is that if you put a barrier above you, it will protect you from this right? And will attacks at least deflect them? The answer to those will effect my final judgement on this one. Petal Knockout: quick question with this one and it's earlier, weaker form (maybe the other one? ), does it mean that they don't disappear after you "throw" them and can continue controlling them? Or is it like, you can punch them that many times in a post? Shield of the Knight Herself: I'd like a note here. Last Resorts are obviously a no go, but so is hado 99. (you can reword this however you like, at most they'll minimize damage from those, depending on the last resort) The only things I can think of that are stronger than a cero oscuras is hado 92 and up, and maybe Rui's Lightning cero in his segunda etapa form (though not by much). Also keep in mind that these stronger forms will take a lot out of her with her average energy amount. Red Like Roses, Part 2: By speed of regular bullets, you do mean same speed of bala, right? How far will the petals home in / for how long will they home in? Effect: Shoots a beam if equivalent strength to a cero, minus the explosion. High probability to actually crack or go through barriers and other defenses due to concentration of the power. It just goes through. Five shots per clip, only two extras, three total as one is in the weapon. As you can see in the above example, my sniper operates like this, but with a bullet instead of a beam. Also Zenke says that you required a damage for his shotgun. And I'm pretty sure for every gun that has passed through here, you required a damage rating for. Just highlighting that fact. 4) That's correct. They function just like shards of steel. 5) She throws the punch and they disappear. That applies for all incarnations of that power. Edited in. 7) I'm presuming maybe either you were tired when you did this or I'm not fully grasping the situation. If I've misinterpreted your point then I apologize and submit myself for disciplinary action. But I wrote: As Zenke told me, the speed of an average bullet is indeed a bala, as you pointed out in your first point. If I need to specify this then let me know. With regard to the rest of it, I admit I worded it pretty badly. I edited it to word it better. Can you see if it makes more sense? The sniper rifle fires an energy beam, not a bullet. If you wanna get technical with it, the clips are more like battery packs. But fair enough on the shotgun (after relooking at it, and some others do too, but usually they use the user's reiatsu and not built in, or they're explosive to some degree). Not all of them actually have a "power" to them. The Coalition Assault rifle for example, doesn't, as does another former member's pistols and Zenke's elemental revolver. Most of the coalition's guns use mildly explosive ammo, hence why some of their's have it. Your choice if you really wanna leave it on or not. I can see that now, but it just enhances your ability to evade or the opponent missing their attacks (and thanks for adding the light part blurring her form). Which you mentioned. You don't have to change the name, just make sure you distinguish the two in rp should you decide not to change the name. Some of them go slower, I was just making sure is all. This one is...weird. I like that the petals go cero speed, the damage is appropriate for a last resort, I like that you can take out the barb, though at great risk to yourself, and that it follows you for three posts if the barb stays in. The two things that bother me, maybe counted as three, is that the barb lowers one's speed by 20%. Normally not a big deal, but combine that with how many petals there are (I'm thinking Byakuya's bankai here, and Ichigo in bankai still got hit by it in that stage I think), and then that they can't be deflected somewhat (maybe not a last resort barrier or something, but still require a very powerful attack or barrier) or damage minimized kinda sets off warning bells in my mind. If you can set something of a minimal power of an attack or barrier to deflect them (they'll end up coming back towards the person anyway) and state that the damage can be minimized, it might be ok. The minimized part is a must. Or you can half the number of petals, or the barb doesn't decrease the victim's speed (or not as much) and not as many petals follow (like three-fourths of them will) or something like that, I'll leave the decision up to you. 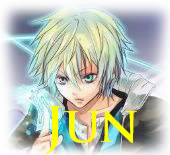 Most last resorts have a preclude, usually a charge up or in Jun's case like another transformation so it's very visible. This one is just take out le special bullet, load it, aim, and fire. Not much of a preclude there. Hence why I want to see it a little bit more manageable than what you have. Sorry my bad. I kept thinking up until this point that I had written that the bullets were reiatsu infused, but I had not. My apologies. Edited in. I added extra things that help to avoid the Last Resort attack. With regards to the prelude, I was hoping that the Part 1 attack was enough of a prelude. If not I will add it in if you need. It is, and it isn't. It's not a direct one like a charge up. There's no reason for one to suddenly assume those petal will be used again in the fight. Anyway, things look good now.